The SATCaster is a standalone dual satellite demodulator. It is fully compliant with DVB-S and DVB-S2 standard. 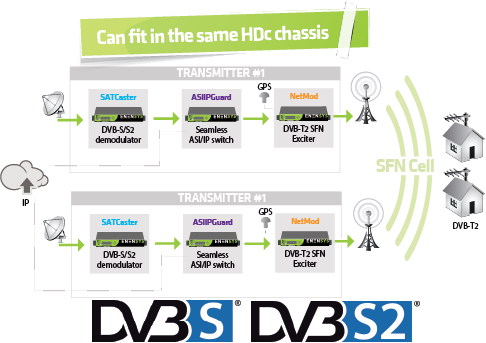 It supports by default all the advanced modes of the DVB-S2 standard such as 16ASPK or 32APSK for providing higher thoughput. The SATCaster features multistream technology so that satellite operators can multiplex several TS in the same transponder; the SATCaster allowing to select individual streams. As an option, the SATCaster can support BISS-1 descrambling to output clear-to-air services. It provides also 1+1 automatic redundancy between satellite inputs so that it can output TS or T2-MI stream stemming from either satellite input1 or satellite input2.